The sport seems to get tougher each year and referees are under ever more pressure to make the right calls. Rod Young considers whether enough is being done to punish those riders who take things too far. "I never try to break records, that is not my main ambition. I just try to win as many races as I can, and if you win races, then you will win GPs as well. I know I only need a small, small slip and I won't be winning, so I need to stay focussed. I never take anything for granted." Who's said what about whom now? Find out in Soundbites! Glasgow's win in the pairs on Sunday has re-ignited the arguments over home advantage in shared events. In recent years it's been the norm rather than the exception for a home winner to emerge from pairs, fours and riders championship. Sadly, the winners of those events rarely get the credit they deserve. They have still taken on the best the league has to offer and emerged triumphant. It's impossible to say for sure that the result would have been different if the meetings had been staged on another track. No matter where the meetings are staged there will always be an inbuilt advantage to someone. Even a 'neutral' track will still favour some riders more than others, perhaps due to previous experience of the circuit or just in terms of the size and shape of the place. This advantage would obviously be reduced from the present position where a rider is riding that circuit every week, and ideally a neutral venue would always be used. Unfortunately it appears that there is little appetite for Premier League racing at Elite League venues and that the Elite League is not willing to stage its shared events on a lower league track. Until that changes, let's give the winners of shared events the credit they are due. These riders have done their talking where it matters - on the track. 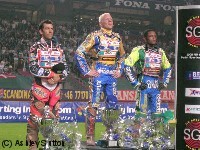 So well done to Shane Parker, George Stancl, Bjarne Pedersen and Andre Compton. You are all worthy champions! Forty years ago this week David John Wills lost his life in a track crash at West Ham. Robert J. Rogers offers this tribute to a man who paid the ultimate price as he entertained the fans. The Veteran Speedway Riders Association have a new website that will aim to keep their members informed of their functions, campaigns and news. The address is vsra-web.co.uk. The Hackney Reunion takes place at Paradise Wildlife Park in Herts, on 22nd July. Bengt Jansson, Zenon Plech and Finn Thomsen are amongst the galaxy of stars that will be attending. Full details at the new website . Don't forget to "Make it date, Friday at eight!" The general consensus appears to be that Glasgow have signed a good one in Leon Madsen. You can find out more about the young Dane at www.teamleon.dk. My recent request for information about Canadian speedway riders was answered by Goldie Restalls' daughter. I responded back several times to the e mail address supplied but received no answers. I was wondering if the lady in question would contact me at tmarriott@sympatico.ca so I can get information on Goldie for our web site in Canada. Armadale action this week with these pictures from the Monarchs clash with Stoke. Stuart Robson netted 18 points as a guest for the Potters, but it wasn't enough to stop the Monarchs. "Bjarne is moving out towards the fence, I am moving out towards the fence and Ferjan is shutting off the gas because Matej is in the middle of nowhere. Then I am in front of Matej and I felt something hit my back wheel. Matej must have taken my back wheel and went into the fence. Sometimes if I do something wrong I agree, but this is stupid. There is no need for this, for the crowd to react in the way that they did because this was not my fault. Ferjan has just gone down after the collision like he does. He did it when Leigh Adams passed him in a meeting on Sky recently and he has done it again." Ferjan's view can be found in Soundbites. Alan Hodkinson brings us good news of the speedway museum campaign. There's still time for you to donate and help make it a reality. "I don't know why there's no consistency with these referees. When the Exeter riders get good starts there's never anything done. I don't mind getting pulled back once, but twice is too much. I made good starts all night and that was the wrong decision. Last year I had a reputation for making fliers at the start, but I've calmed down a lot this year and haven't been making as good starts. But my reputation preceded me this time." Check out Soundbites for topical comment. How on earth the return of speedway has been refused in Ellesmere Port is a mind boggling situation. I attended a meeting a long time ago (around 3 years ago) and permission to re-establish the Gunners was refused. At the meeting I attended there were approximately 200 people and only 8 showed their hands at the against vote. Bearing in mind the meeting was held next to Thornton Road stadium (home of the Gunners) for the residents of the area it came as a shock a week after the meeting to find permission had been refused! After all the meeting was for residents so why didn't they protest? Because the majority didn't mind the return of the Gunners. Tests were made on the track and it was found that the noise pollution from the adjacent motorway was more socially intrusive than the noise of 4 speedway bikes lapping the track! It pains me to this day as I watched the Gunners for 10 years and never once had any altercations or trouble from the local residents. Maybe this was due to the fact that most were at the speedway meetings themselves! A disgruntled speedway fan from Ellesmere Port. Philip Dalling answered our call for an article on the late Ivor Brown. Ivor will forever be remembered for his points piling for Cradley Heath and the crisp white football jersey he wore over his leathers. Philip tells us more about the man - both off and on the track. We have action pictures from the midweek clash between Hull and Edinburgh. The Monarchs emerged as surprise winners from the Premier League clash. Photographs are courtesy of Adam Jennison. "It's great to be able to say that I'm finally fit to return to the Reading team. I've been down to Smallmead a few times to watch the team, but it hasn't been easy to be a spectator as I've been itching to get back out on track myself. I've had the plaster removed from my leg and done some work on it and it feels good. Hopefully I can get back into the swing of things quickly and get back to the form I had before my crash." Kevin Lloyd is looking for information on his father and uncle - Wally and Jeff Lloyd. We're certain that someone out there will be able to help him. Hastings Saxons only competed in two seasons of league speedway, 1948 and 1949. Now, more than 50 years since their closure, they have a website! It's a fascinating site that includes many press clippings taken from contemporary newspapers and some modern pictures of the stadium - with the track still very much in evidence. You can find it at hastingsspeedway.co.uk. Testimonial man Carl Stonehewer has launched a new website to tie in with his big day. The website can be found at carlstonehewer.com and "Carl's Big Special" will be held at Derwent Park on Saturday 24th September, with a 7pm start. "Let's not get carried away with the implied cynicism of John Postlethwaite's motives or premature praise of Lindback's undoubted talent. Any professional sport needs promoters who in turn need to show a profit . The more profit they make the more valuable the riders become as assets, ensuring safety stays high on the agenda. John Postlethwaite today is basically no different to Johnny Hoskins 80 years ago. Without Hoskins there would be no Speedway. Without Postlethwaite, and one or two like him, there would be no Speedway as we know it today. We would still be stuck in the shambles the sport was in during the mid 1970's to about the late 1980's. As for Lindback he is, at the moment, just another very good rider. I can think of a dozen 19-year olds as good as Lindback over the last 45 years who never fulfilled their potential. On the other hand, some riders take longer to mature but reach greater heights when they do. Let's keep in mind that when Ivan Mauger was Lindback's age he had hardly mastered the art of staying on the bike, and it was not until he was in his mid-twenties that he could be called a genuine world class rider. For Chris Seaward to refer to use the word 'genius' to describe Lindback is to grotesquely distort a word that should be reserved for only the absolute cream. In my book a Speedway genius is a rider who comes up against the impossible then just kicks the door down and says 'this is how you do it'. Let's reserve our judgement on Lindback for a few years and give him a chance to mature in what is probably Speedway's toughest and most exciting era for more than thirty years. In the meantime, I would personally would limit the use of the term 'genius' to Ove Fundin, Barry Biggs and Tony Rickardson, but to pick the best of those three would depend on gate positions! So, Speedway fans who is your Speedway genius?" "Nicki Pedersen is a hard racer, okay he gets a little carried away at times but to be honest he puts bums on seats and that is what this sport is about. Nicki is one of the most exciting riders around. I for one would not go to the GP's to see 16 Tony Rickardssons. Excitement is what puts bums on seats - simple! A reminder that you can read some exclusive book extracts here on the site. These come from "Penhall - World Speedway Champion" and "10th Yer Baws!" by Steve Johnson and Gary Lough respectively. Penhall - World Speedway Champion: The story of the 1981 and 1982 World Champion's career. 10th Yer Baws! 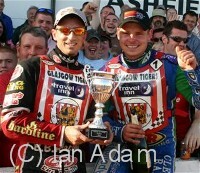 : A personal account of following the Edinburgh Monarchs on their way to the 2003 Premier League title. 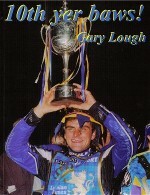 We'd be willing to feature extracts from other speedway publications - contact us via email. "Whether you are a speedway rider, a tiddly winks player or a car salesman, if you don't get the results expected your job is in jeopardy and I'm afraid that's the position Sam finds himself in. There is no way I can tolerate a second heat leader failing to score and we have to act now to try and salvage the season. I have been very concerned about Sam for a while and last night only heightened that. I will be looking all over the world to see if there are suitable riders out there." Peterborough manager Trevor Swales - Is the end in sight for Sudden Sam? How much longer before Nicki Pedersen either does someone serious injury or worse still kills someone? He is a "loose canon" completely out of control. He has no regard for any other riders, or for the sport of speedway. Bjarne Pedersen must be dreading each time that they race against each other. Time after time he comes from the inside and rides straight across the other riders, he just "wipes them out". At Cardiff he was off the inside, saw Greg Hancock coming round him (he looked at him) and (deliberately?) took him out. There isn't a Grand Prix in which he fails to get involved in some controversy. Time for the red card! If you listed the great speedway cities then it's unlikely that Nottingham would feature. However the city was once home to the Nottingham Olympic Speedway, a prominent circuit in the pre-war era. Philip Dalling takes us through its history in 'Ferry to the Speedway'. 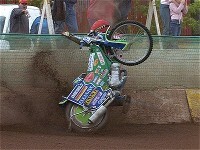 Colin Poole sent us an excellent crash sequence from last Sunday's match between Glasgow and Workington. George Stancl was the rider involved and, of course, he walked away unharmed. "Nobody is saying 'Krzysztof Who?' any more. We seem to be building a record of bringing people in who few people have heard of and turning them into a success. Krzysztof is getting his head around British racing and things are becoming much easier for him. He had problems with the language. But we have a mechanic working with him who used to work with Adam Skornicki and the communication has improved." We're looking for details of a rider named Lawrence 'Scottie' Michie. He was around in the sport's very earliest years and is believed to have ridden at Rochdale. "Ivor Brown comment by Linda. The Vintage Speedway Magazine issue 49 the latest edition has a two pages and three pictures about the man - not much but she may be able to have a look at her local track"
We will feature an article on Ivor next weekend. "Fantastic website! 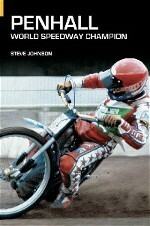 Absolute perfect for a speedway history minded person like myself. Have spent the whole day here, and I will soon be back!" "A very well written and observed article, and I'm sure with points of credence." Alan Hodkinson tells us that a copy of his 'Once a Jolly Swagman' DVD recently sold on ebay for £52 (plus £2 for p&p). Quite incredible since Alan can sell you one direct for only £11.50 - including p&p! You'll also be helping the VSRA museum fund. Full details, along with pictures from the movie, by clicking the image below. Sittingbourne rider Aaron Baseby has now got a website. Aaron is taking part in this year's Under 15 championship. More action pictures - this time from Sunday's Premier League match between Glasgow and Workington. Shane Parker scored a magnificent 20 points, alas his team mates could only manage a further 22 between them. "I think we have made a good step to go to the next round. I am pleased as I have had many problems with my machinery. I have had seven engines blow up this season, four of them in England and three in Czecho, and I am always looking for a new tuner. I also fell off with the French guy Tresarrieu and damaged a complete bike. That cost me a lot of money as if you want to race good you must buy the best parts for your engine." Chris Seaward's article 'The Talented Mr. Lindback' is perhaps the most unusual we've ever published on the site. He pays tribute to Antonio in a rather indirect manner. Well worth reading and, as always, we'd be interested in your comments on the article. "We put a new engine in tonight, which is something we have been struggling with and it was really good. It's been a tough time for me in the last month or so, in the Grand Prix as well, but it was nice to come here tonight and get a good meeting in. Obviously we needed that as well so I'm pleased. It's been a tough start, but hopefully I've turned the corner now and things will get better." Plans for the VSRA museum are continuing to progress and a substantial amount of money has already been pledged. Alan Hodkinson brings us up to date in this latest progress report. Newport's promising Aussie Karlis Ezergailis now has a very impressive personal website. It's been designed by the prolific Black Diamonds Web Design company. It features the usual gallery, news and profile. The address is simply www.karlis.co.uk. Ten year old Cameron Hoskins is the subject of a professional looking website that can be found at cameronhoskins.co.uk. 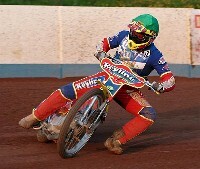 Cameron had his first racing experience at Sheffield Training Track and hopes to ride for Wolves one day. "I would like to say how much I enjoy your web-site, having recently purchased a laptop computer and found Speedway Plus. I was a little surprised after the death of Ivor Brown that you have not produced an article on his speedway career. I hope this will be on in the future. Thanks once again for the brilliant site." We'd be delighted to publish an article on Ivor if anyone cares to submit one. "A fantastic site that makes you want to come back for more !" Samantha Laube is looking for information on Laurie Gilbert Davies a former Australian sidecar champion. Can any of our Aussie visitors help? Barry Dalton is searching for Peterborough away programmes in the hope of completing his collection. Dawn Scott is trying to locate a video of an Oxford v Swindon match from around 15 years ago. Swindon emerged victorious from the encounter.